Mention the words Scotland and Tattoo together and no one would blame you if your thoughts immediately turn to the Royal Edinburgh Military Tattoo held annually in the month of August in the capital city as part of the Edinburgh International Festival, celebrating its 70th year in 2017. However many might be surprised to learn there is another, if much younger, military tattoo well worth making a journey to Scotland for -- the Highland Military Tattoo at Fort George, Inverness. Entering only its 4th year, the Highland Military Tattoo was born in 2014 out of a project to upgrade the museum of The Queen's Own Highlanders that is housed at Fort George. The Executive Chairman and Director of the Tattoo is a former commander of the Highlanders, Major General Seymour Monro. Entering only its 4th year, like its more famous relative, The Highland Military Tattoo also offers a dramatic backdrop in the form of historic Fort George near Inverness in the Scottish Highlands. While perhaps not a worldly icon on the level of Edinburgh Castle, Fort George has a long and storied military history. The original fortress, located in Inverness and built in 1727, was destroyed by the Jacobites under Bonnie Prince Charlie so the present day fortress was constructed in 1747 on land at Ardersier, about 11 miles (18 km) northeast of Inverness, which forms a promontory jutting into the Moray Firth and controls the sea approach to Inverness. (Wikipedia) It has been in continuous operation since that time and has never been attacked. The term "tattoo" in military parlance is an evolution of a Dutch term that dates to the 17th century. It was originally a drummer's call to signal local publicans to "turn off the taps" so that military men could return to barracks at a reasonable hour. With the later development of full military bands this drummer's call evolved into a form of ceremonial evening musical entertainment for the troops and has further evolved to the combination of bands, singers, dancers, and re-enactors that we know as military tattoos today. 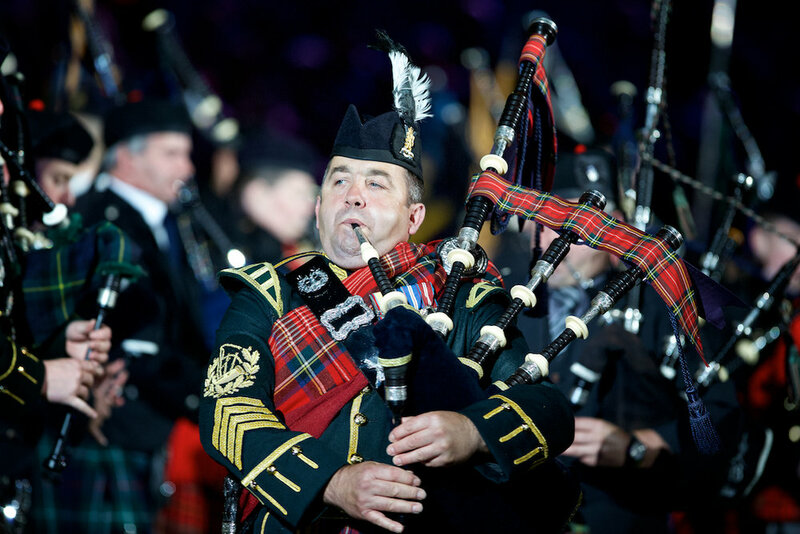 The Highland Military Tattoo brings together culture, tradition, and history and features a combination of bands, highland dancers (both traditional and contemporary), historical re-enactments and more. 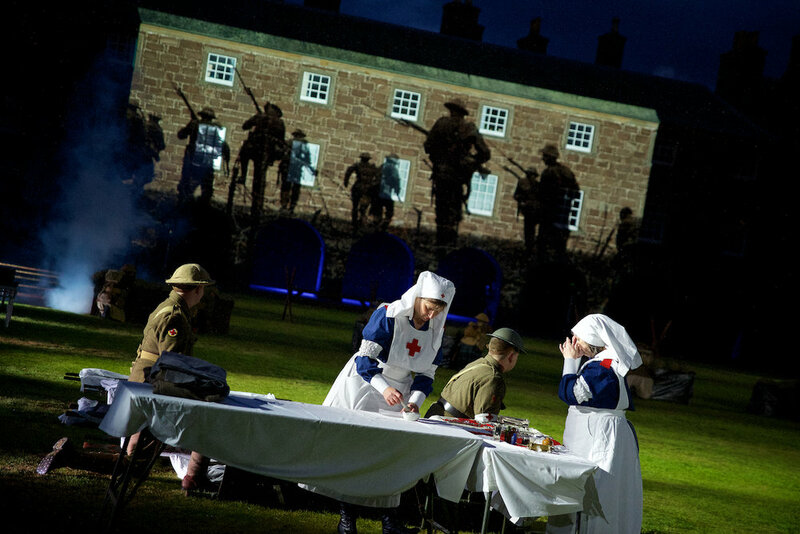 Visitors are encouraged to arrive early to stroll the ramparts, tour the Highlanders' Museum, enjoy the food village pre-show and often interact with performers and soldiers alike. Award winning Scottish photographer John Baikie shares the amazing scenic beauty of the North Coast 500, Scotland’s “Route 66” road trip in his first book financed largely via crowdfunding on Kickstarter. The Majestic Line is an award winning small ship cruise line that offers a unique "mini" cruise ship experience throughout Scotland's west coast and islands. Go behind the scenes of the Highland Military Tattoo with its Director, Major General Seymour Monro. The Historic Inns Tour offers an easy to follow route through the Scottish Highlands using four historic Inns as anchor points to see many sights along the way. If ever there was a land sculpted for scenic touring it is Scotland. The question is not what to see, but how best to see it. One man, Colin Baird believes the answer is, the bicycle. Dubbed "Scotland's Route 66" the North Coast 500 is the most successful tourism initiative in recent years and is being called an ultimate Scottish experience. A sailing holiday to Scotland offers a view of the landscape many will never see, fine dining, quiet anchorages on pristine beaches and nights under the stars. From sea coasts to inland lochs and canals Scotland is the world best sailing destination. Dunnotar Castle is one of the best known landmarks of Aberdeenshire. The region is rebranding itself in an effort to restore tourism interest, lost in the wake of the discovery of North Sea Oil and its resultant economic boom. Steam trains have operated on the Fort William to Mallaig extension of the West Highland Line since it opened in 1901 following completion of the Glenfinnan Viaduct. Today the train and viaduct are world famous and most often associated with the wizardry of one Harry Potter!